No one knows how happy I am right about now. I’m still not happy about how Election Day turned out last November, nor am I happy about the loss of so many great people in the past month. But I already have a feeling that 2017 is going to be a better year for me, despite that my favorite President is leaving the White House in a matter of weeks. On New Year’s Eve, I got an email back from Write and Author with the interview questions. Today, I sent back my answers. I think I was pretty eloquent and knowledgeable when I wrote them back. Though perhaps, I think I was a little wordy. I wrote paragraphs and more paragraphs to answer their questions, but I think I got my point across. I want to empower my readers. 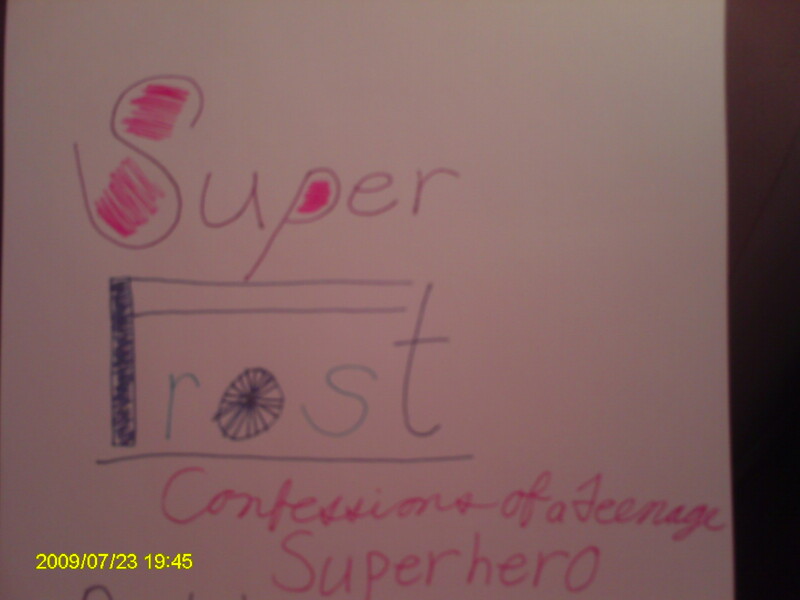 With Super Frost, I plan to make it my debut novel to get young readers to believe in their power to succeed in life, with superpowers or none at all. And with that in mind, I’ve prepared a little snippet of my latest work here on WordPress, just for you. I even started making my own book covers and how I wanted the spine of the novel to look. Thanks to my mom giving me the 52 gel pen set, I let my creativity thrive. But since I’m not really an artist, I kind of want someone else to draft some cooler design for my first book, maybe with an ice blue cape on the cover, signifying Violet’s signature color of her powers. Plus, blue would make Violet’s eyes more vibrant. This year for New Year’s, I had the best time to start off this year on the right track. My boyfriend gave me my third Christmas present at my friend’s New Year’s party, which I was supposed to get the day before Christmas Eve, but didn’t because the hand-crafter sent it out late. It was handcrafted all right, but what exactly was it? Jewelry? A sculpture? Something pretty? 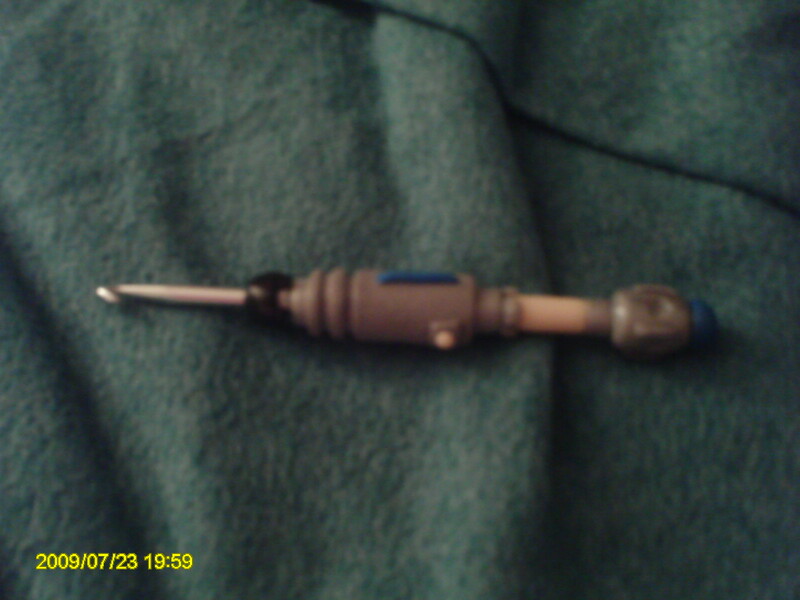 Actually, it was the most beautiful crochet hook I had ever seen, made after the Tenth Doctor David Tennant. Silver and blue at the end. Isn’t it gorgeous?! I still want a real, authentic Twelfth Doctor’s sonic screwdriver, the blue and gold one he uses in “The Husbands of River Song” with four settings, or the trans temporal sonic screwdriver that you usually see in Barnes and Noble and Hot Topic, the one that looks like a piece of steampunk machinery. Maybe I’ll get one next Christmas when I have more money. My boyfriend loved his Christmas present, though. He did get a kick out of the mug that had the main ponies on it, including Pinky Pie. How did you guess that my boyfriend likes My Little Pony? And he’s putting that mug to good use. Right now, I am really excited to see how my article is going to turn out. When you get the chance later this month, and I’ll let you know when it’s live, go to WriteandAuthor.com to see the in-depth interview with me. Until then, I have to get back to my novel. I’m still stuck on chapter eight, at the moment Violet goes to battle class for the first time and she’s terrified of getting beaten by her enemy, Jeremy, better known as Solar Fury. Maybe a little movie with some superheroes like Vision and Scarlet Witch will knock me out of my writing trap. This entry was posted in Authors, Blog, Fiction, Literature, NaNoWriMo, Nerd, Reading, Science Fiction, Writing and tagged Camp NaNoWriMo, Farpoint 2017, Lady in the Blue Box, National Novel Writing Month, Rachel Ahrens on NaNoWriMo, Rachel Beth Ahrens, rachel beth ahrens fiction and more, Rachel Beth Ahrens's new novel, rachel beth errands, rachelbethahrens, Super Frost Confessions of a Teenage Superhero, Super Frost new novel Rachel Beth Ahrens, Super Frost Rachel Beth Ahrens, Supernova Entropy. Bookmark the permalink.